I wasn't going to post until Friday but I just looked at my schedule and it's wild, so this is going up today. The winner of the Rustic Ribbon oilcloth trash bag is... Lori_r8. Give me a shout at lemonademakinmama@comcast.net to claim your prize girly! 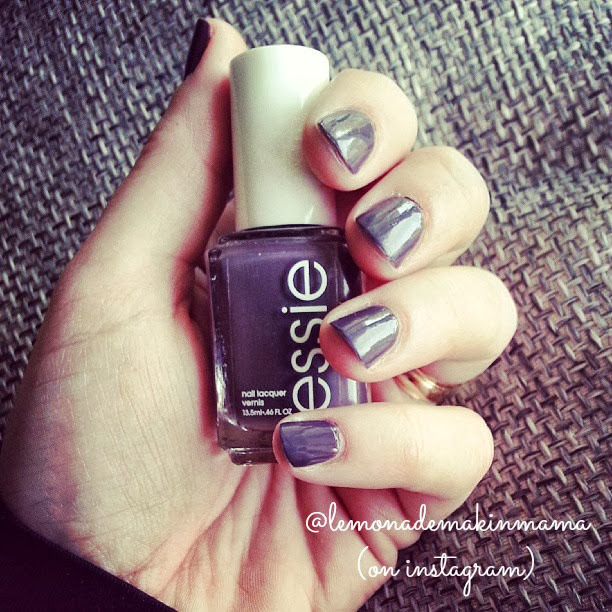 Current Favorite- This rich gray-purple polish by Essie. "Smokin Hot." It's a nice fall shade and I have been trying to keep one of my New Year's resolutions "to take better care of my hands," since I work with them. They normally look awful. This may be the one resolution that I've kept for the most part. Currently waiting for-the same thing I'm always waiting for. My man to find his niche in the work world. 'Nuff said. Currently excited about- An upcoming girls weekend away in November with my book club. Much needed. Much, much, much. There will be laughter, shopping, walking, talking, eating, movie watching, coffee sipping (well, them- not me cause I only drink tea) and possibly some rule breaking. Cause that's the way we roll. Currently trying- a body detox. I'm drinking 60 oz of water with dandelion root tea with splashes of lemon and cranberry juices each day. It's supposed to flush out one's system or something like that. It's nasty, not gonna lie, but I'm trying a week of detox because I was having the worst headaches of my life and I decided I needed to do this, plus eat clean, and skip sugar altogether to see if it will help. So far, four days in, my headaches are gone. Well, duh. Eat well, feel better. Currently working on- Two knitted ruffled scarves because why finish one project to completion when you can begin another one and leave the first one half done, I always say. Currently using- curl enhancing products. My hair was slightly wavy before kids, and after having both babies it's crazy curly. My kids call it the lion's mane. It kind of does look like that too. I've got a hair apt scheduled and she is going to chop it or something, and color all my highlights back to my natural color because I've decided to grow out my gray too. Basically I've got to make some cost effective changes in the hair care department. I am actually kind of excited about this and have been talking about it for years so we shall see. I feel like an entire post devoted to this subject should be forthcoming. Currently wearing- the cutest little rose gold "s" necklace... a precious birthday gift from one of my most beloved friends. Currently starting- A weekly evening class with my sweetie pie, at our church. I don't even know what it's about and it starts tonight. My man just asked me to come and so I am. I'm sure you haven't heard the last of this. Currently preparing- for my man to whisk my boy away for a weekend so they can work through the Passport to Purity program (by Family Life Today). After seeing all the fun projects and things they get to do I am a tad jealous that I don't get to do it, but I will get to do it with Ava next year. And get this- God just loves us... and I should never doubt it. In this passport program, you are supposed to do a big fun thing at the end to kind of bond. Well, I won two Seattle Mariner's tickets, so my boys get to go sit in a suite, eat free food and have a big free fun thing as their finale. They never would have gotten to do that if I hadn't won! Doesn't that give you chill bumps? God just knew. I love that. Currently wishing- My brother and his family lived down the street. I am a classic mother-hen and I do not care to be otherwise. We should be within "warm sauce" distance apart, and if you know what that phrase means I adore you because you also watched Everybody loves Raymond. Currently doing- a 30 day photography challenge. I found mine here and just started it today. Day one was a "self portrait." (Here is my first day's assignment- I laid on the floor and faced the camera with our big sliding doors at my back and hit the self timer. Eh... it's a self portrait. Not much more to say about it.) The point is, I need to get myself motivated to pick up my camera again because I've been so busy working that I haven't been blogging as much and you know what? I miss it like crazy! I will definitely post all my shots once I'm done. Some are very challenging. I like that. I am going to try and use my Photoshop program to edit my future photos in this 30 day challenge, after today... eek! Wish me luck! That is the bargain I made with myself. Okay now that we're all current on my end... what's currently happening with you? I just love your heart!! I had the joy of going through Passport to Purity with my daughter! Such a blessing :) My hubby is currently planning his trip with our middle son :). Blessings to you!! can't wait to read about it! I saw that video on fb but ignored it!! I'm so glad that you shared it!! That was the CUTEST thing ever!!!!! I love that you have afternoon tea with Ava, that is the SWEETEST thing ever!! I haven't had a "professional" paid for hair cut in three years!!!! A dear friend of mine took care of me for a while and recently my sweet mama has been doing it (she was a hairdresser before she had me ~40+ yrs ago). My dear daughter has been my colorist along with a box!! I'm feeling better and stronger every day (pneumonia)!! Listening to - NPR, a lot. Current favorite - Coconut oil melted in a pan, add spinach til' wilted, add two scrambled eggs, swirl, scooch together and flip over. Serve with a piece of fruit. Breakfast of champions. Waiting for - The empty hole where my life used to be to fill back up again. Moving is tough, even when it's on purpose. Starting - To think about the holidays and how I can make them special for my family. Preparing - Risotto, it's what's for dinner. Wishing - The grass was greener on MY side of the fence. Excited about - The new indoor bike park they are opening in Burlington. My enthusiast son can ride all winter, yay! Trying - To get my sheet together and start blogging again. Working on - Just going with it... it's hard. Enjoying - Tarts. (See new cookbook, above.) Have made plum and cherry. To. Die. For. And so easy. Using - My big girl words to convince the HOA to let me plant grass in my parking strip. The storms keep washing out all the wood chip down the hill. Wearing - Scarves. Every day, YAY! Starting - To want to crack open my French books again. Planning - A pumpkin carving / Weenie roast in the garage fun night for the kids on our street. Doing - Just less than my best. But at least I have my feet under me enough now to be realizing it. Wanting it is half the battle sometimes. Feeling more motivated. It's progress. i've never even met you and i miss you. no joke. long lost friends a million miles apart. okay. i need 365 project in my life or 30 day photo challenge or something. you inspire me. if i want to get better at capturing, i need to take pictures EVERYDAY. Your self portrait is wonderful! I just bought that same polish. I want to learn to knit. What a great time your menfolk will have. Really great. That video is so cute! It's things like that that make me so sad that my kids are getting big. your curly hair looks awesome! I love reading these lists. Good luck with the detox...headaches are the absolute worst. I would love to know what books you are reading about Aspies. Have a great weekend. Is that the ruffle scarf pattern from last year? 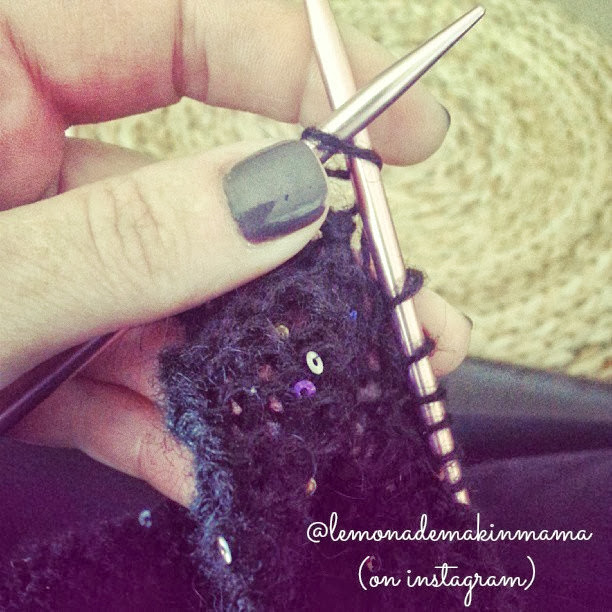 what size needle are you using and what gauge yarn? I tried one and I think I used the wrong size! Growin out my grey as well! I've colored my hair for over 30+ years! My hair is naturally ALL grey now, so am adding highlights to "blend" in the grey and not give myself a heart attack when I look in the mirror! Ha! Learning to "grow old gracefully" as they say! Taking time to enjoy the beautiful weather and my youngest daughter's baby shower this weekend. Learning that it is OK to enjoy myself and not work ALL the time! Take care! I grew my hair out about 5 years ago after seeing a "really blond" picture of myself - it was awful! Like Jen, I had a few highlights put in, for about a year; totally natural, ever since. My kids say they like it; my husband doesn't care :) I read all the time - books, magazines, blogs. Love your polish, love your hair, love that you can have tea time with your daughter. The video was darling. Thanks for sharing a part of your life with all of us. Oh Sasha, you and I could talk for HOURS over the waiting for "husband find his niche". We have been on that crazy prayer journey for the last 4 - 6 years and recently moved from the Seattle area to sunny Phoenix. I'm praying for you guys. Here's the thing...DON'T STOP ASKING (God, that is). He won't put you to shame. P.S. 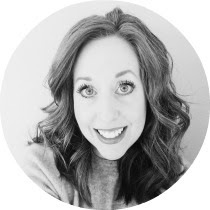 You're just such a darling gal, wife and mom, and you're doing it...that making a life thing...that impacting future generations thing...that making your Maker grin thing! What a great self portrait! And, hair is an ongoing project for sure, especially once you start coloring it. Oh, my! if I had back every dollar I have spent getting my hair professionally colored, I'd be a wealthy woman. Have a great weekend! I too have just decided at the end of the summer to embrace the gray. I am a teacher and do a lot of swimming over the summer so I don't bother coloring until school starts back. I look forward to reading what you have to say about it. I got fed up with coloring my hair about 3 years ago and I had my hairdresser give me heavy highlights to let the gray blend in. It didn't take long before it was basically all gray except for the back. It helps that I keep my hair very short. I have gotten so many compliments since I did this and it's so much cheaper and easier to deal with. I say go for it! i've also been trying the "au natural" look for my hair - was always pin straight while "growing up" but after children and radiation - i have some curl. It's kind of fun trying to figure out how to keep the wee bit of curl i have without letting it get crunchy (or frizzy). i think it's just easier to keep things as God gave them to us! spending so much on color makes me NUTS!! what yarn are you using for your ruffle scarf? i made a few of these last year (thanks for the original info!!) and LOVE them... but.... something with some sparkles... yup... time to hit the craft/yarn shop! :) perfect for killing time while waiting for my doodles and all their after school things. 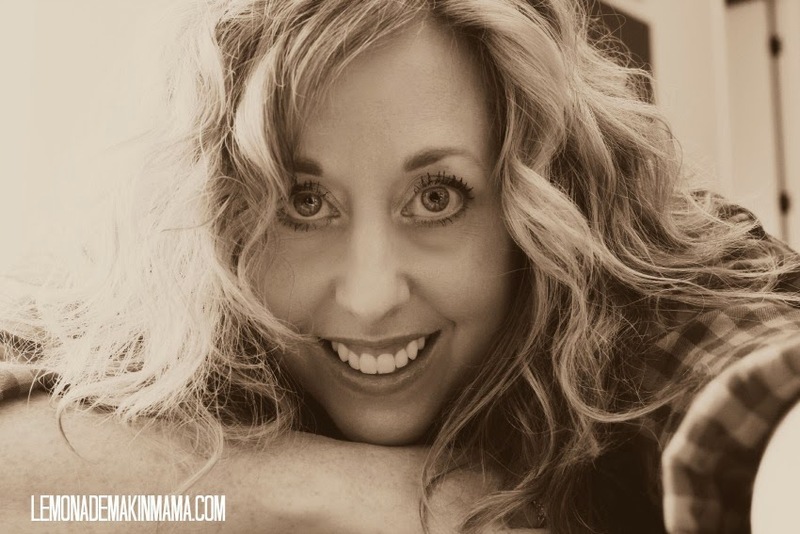 thanks for keeping it real - it's always so refreshing to sit down and read your blog. Love that selfie!! Too cute! Giveaway with the Rustic Ribbon! Shop talk, news and winners. Home for the Holidays e-course GIVEAWAY!! Girls Night OUT with Almay.